As summer ends and winter approaches, food plant managers need to change their focus and strategy if they want to keep insects and rodents out of their plants. Pest control is an important consideration for food manufacturing facilities at any time of the year. But as summer ends and winter approaches, food plant managers need to change their focus and strategy if they want to keep insects and rodents out of their plants. "Depending on geographical location, winter can provide some relief from exterior pest pressures. However, certain parts of the U.S. will see year-round pressures from outdoor insects," says Patricia Hottel, technical director at McCloud Services (www.mccloudservices.com), Hoffman Estates, Ill.
"There are definitely some seasonal pest differences in the temperate climates. There are several types of fall invading pests to expect as summer comes to a close. Several of these pests invade structures in search of a place to overwinter," she says. In agricultural areas, the harvesting of crops can spark changes in pest behavior, even before the mercury begins to drop. And there are other seasonal forces at work. "Ants are one of the insects we see early in the spring in northern climates," Hottel says. "Filth flies, small flies and stinging insects like yellow jackets, hornets and paper wasps, peak in July and August." 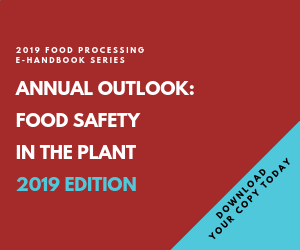 "Each season brings different opportunities for pests to find food, water and shelter within or around food processing, packaging or handling facilities," adds Dale Bauerkemper, vice president of operating companies at Wil-Kil Pest Control, Wisconsin, and Holder’s Pest Solutions, Texas. Both are part of Copesan (www.copesan.com), Menomonee Falls, Wis. Solutions typically include blocking ingress and chemical treatments, but there are some new technologies in the market. "Although chemical applications can offer some immediate relief, environmental control methods that drop the relative humidity levels, removing the water pests need to survive, are required for real long-term resolution," says Bauerkemper. Paying attention to landscaping also can limit opportunities for outdoor critters and insects to find their way indoors. The latest technologies for eradication are focused on disrupting reproduction, says Hottel. McCloud has recently introduced such a product that helps control moths. "The pheromone mating-disruption products for Indianmeal moths and related species are relatively new and making a dramatic impact on the way we perform stored-product moth control," Hottel says. "These products are working exceptionally well in impacting stored-product moth infestations." In pest control, an industry that has traditionally relied heavily on hazardous chemicals, these kinds of innovations represent a way to go "green." They are also especially pertinent for food-industry clients, who must be more careful than other companies when it comes to internal environmental issues. "Just as our world has seen technology advance exponentially in recent years, being green today is merely one small step compared to what green, sustainable practices will mean five or 10 years from now," says Bauerkemper. "While we may still need pesticides, the components and use of them could be completely different." Food processors are accustomed to working with very specific government regulations, and for food manufacturing pest control, an example of this can be found in the area of documentation. "The third-party food safety standards and regulatory changes are having the greatest impact on documentation requirements," Hottel says. "Documentation has always been important but it has taken a new emphasis with more detailed information required. For example, trap captures have always been required documentation but we see increase demand for proof of written protocols and detailed documentation showing that the protocol has been followed. " Another regulatory change has eliminated the use of a specific fumigant — methyl bromide. "There are still some use patterns that have not been suitably replaced by alternative fumigants or strategies," Hottel notes. "The food industry, pest management manufacturers and pest management industry have been working to continue to find alternatives." Recent service elements that Copesan has introduced include RapidTrax, which enhances communication through electronic data collection including barcode validation and real-time web access to pest management programs. Some new services also have interplay with seasonal strategies that a plant manager and a pest control provider will follow, says Randy Allen, regional manager with Wil-Kil Pest Control. "With our electronic data collection abilities, we can look at trends and prepare proactive solutions for seasonal pest issues," Allen notes. "For example, common sense dictates that rodents, particularly mice, move inside during the winter. However, when we run the data for food processing facilities, we often find that rodent activity starts much earlier, in late August, in Wisconsin." New documentation requirements add to the argument for managed, integrated approach. Two food plants, two pet food distribution centers win Orkin awards.